If you are looking for a cheap Gingerbread running Android phone is US then Verizon has an exclusive offer for you. They just announced Android 2.3 running Samsung Illusion. It's an affordable Gingerbread-based smartphone which has a 3.5-inch HVGA touchscreen, 3 megapixel rear camera and the usual connectivity suspects - Wi-Fi a/b/g/n, GPS with A-GPS and Bluetooth 3.0. Inside Illusion’s body you can see a older Hummingbird chipset with a 1GHz ARM Cortex A8 processor, PowerVR SGX540 graphics and 512MB RAM. The internal storage is 2GB, expandable via a microSD slot. Samsung Illusion is available for online purchase from November 23. It's free with a two-year contract for a Nationwide Talk plan (starting at $40) and a data plan (starting at $30). 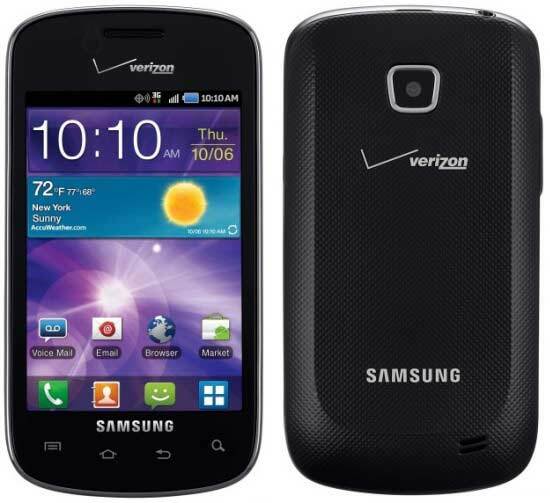 The handset will hit Verizon's retail stores at January 2012. By that time everyone is talking about another upcoming major release from Verizon, Samsung Galaxy Nexus/ Nexus prime.